This happened yesterday, but better late than never… As a Pentax shooter myself, I am very interested in this new mirrorless model. While other companies are coming out with their mirrorless line, Pentax is the first to release a DSLR that uses the existing catalog of Pentax K-Mount lenses. There are over 100 currently available lens models from Pentax and other vendors as well as countless historical glass that is out there. The K-01 is shipping to retailers already and retails from $750 for the body only or $900 for the body with a new DA 40mm XS lens). Up to four colors are available depending on your region. Featuring a contemporary yet classic style, the K-01 provides discriminating photographers with a full array of advanced functions and user-friendly features in a camera body with remarkable form and function. 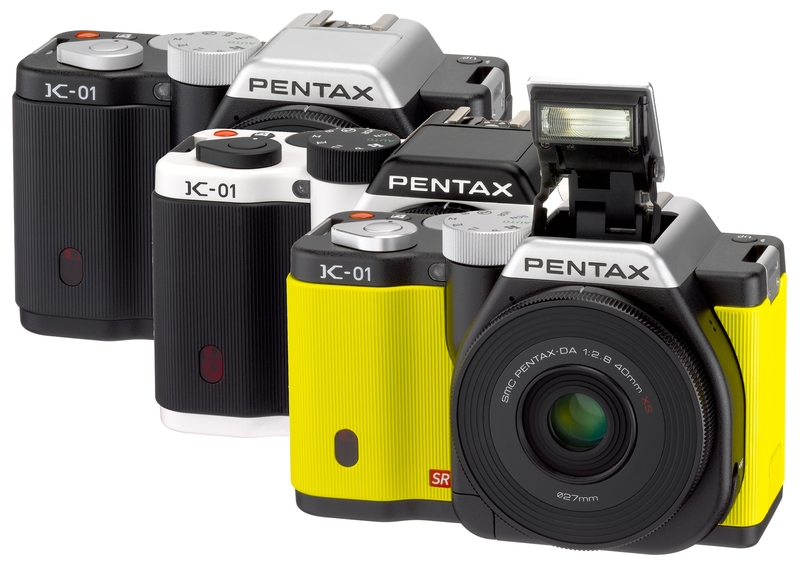 Available in black, white and Newson’s signature yellow colors, the new K-01 features the designer’s autograph logo stamp on the bottom of each camera. The famed designer’s touch also is evident in a new smc PENTAX-DA 40mm F2.8 XS interchangeable lens. As the world’s thinnest interchangeable lens,* the new 40mm combines with the PENTAX K-01 camera body to deliver a unique mirrorless ILC system that is perfect for photographers who are as keen on design as they are on performance. Together, the K-01 and 40mm lens system mark the intersection where high technology and high design meet. Large, newly-developed, 16 megapixel APS-C sized CMOS image sensor with low noise image capture and multiple aspect ratios. Bright, high resolution 3-inch LCD with 920,000 dots. A new “PRIME M” imaging engine ensures first-rate movie recording performance in a digital interchangeable lens camera. The world’s thinnest interchangeable lens for lens-interchangeable digital SLR cameras, as of February 1, 2012 (based on PENTAX’s research). Flexible ISO range of 100-25600 ensures noise-free imaging in virtually any lighting condition. This entry was posted in Camera Announcements and tagged camera, K-01, pentax, ricoh. Bookmark the permalink.